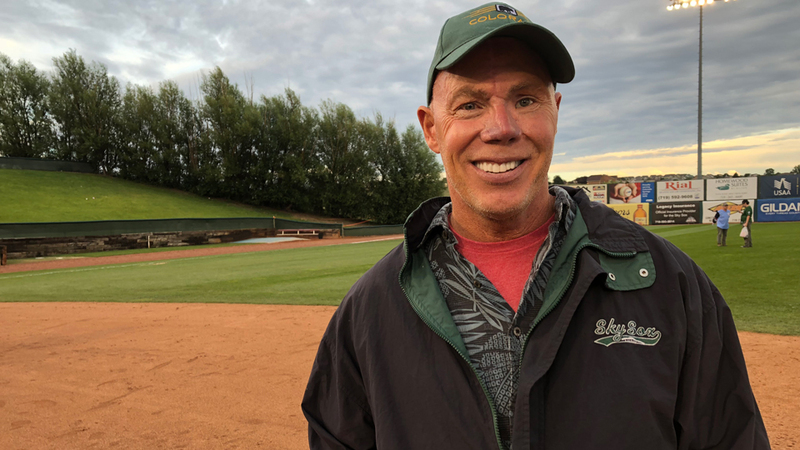 Rai Henniger worked for the Colorado Springs Sky Sox from 1991-2007, when a near-fatal fireworks accident ended his career. One fateful evening early in the 2007 season, Rai Henniger nearly lost his life. Then the Colorado Springs Sky Sox senior vice president of marketing and promotions, Henniger was wiring fireworks behind the scoreboard at Security Service Field. For him, this was a routine task, as commonplace as coordinating a pregame ceremony or emceeing a between-inning contest. "From what I understand, [the Sky Sox] were the first team in the country to guarantee aerial fireworks at every game," said Henniger, speaking after the Sky Sox franchise finale on Labor Day. "We did them for the anthem, Sky Sox home runs, seventh-inning stretch and after we won. So I became a licensed pyrotechnician and I got a federal explosives license and it worked real well for, like, 990 games over 14 years or something like that. "And then, due to a mishap caused by an electrical contractor, when I was wiring them on May 12, 2007, it launched into my face and so my left eye was blown out and my nose was gone. So they made a new nose out of a rib, and I had extensive brain damage. Frontal lobe was smoked. Matter of fact, it's somewhere behind the scoreboard now, and there are probably crows pecking at the brain jerky." Clearly, Henniger uses humor as a coping mechanism. It's a tendency exacerbated by his frontal lobe injuries, which resulted in a reduction of his impulse control. But in conversation, he also radiates gratitude -- especially when talking about what transpired in the wake of his accident. "Luckily, our groundskeeper -- Steve DeLeon -- had met two members of the Fort Carson Salute Battery. We had cannons out here for Fort Carson Day [at the ballpark]," he said. "They went back out there [behind the scoreboard] along with everyone else when they heard that big 'Woomp!' and nothing was in the sky. Those three guys, Steve and the two soldiers, kept me alive until the ambulance arrived, and then I was given a less than one percent chance of living when they sent me in a helicopter to Denver Health. Luckily for my wife [Heather], she was in such shock, she heard 'Less than one percent chance of dying.' So she thought, 'Well, he looks a little different but we'll get through this.'" Henniger's traumatic accident resulted in a sudden end to his Minor League career. His experience with the Sky Sox went back to the franchise's previous incarnation, the Hawaii Islanders. "My first game with this franchise was as an 11-year-old," he said. "My family had just moved to Hawaii and we watched the Islanders play at Honolulu Stadium, which was nicknamed 'The Termite Palace.' I was hooked. We had a fireworks show after the game, so my first game with this franchise and my last game with the franchise had fireworks. But I've loved them ever since. They're just a part of my life, as a fan and then a front office guy." By the time Henniger graduated from the University of Hawaii, the Islanders had relocated from "The Termite Palace" to the 50,000-seat Aloha Stadium. The Hawaii Islanders played at Honolulu's Aloha Stadium from 1976-1987. "Fred Whitacre had just been named the general manager, for his second stint. And I remembered how fun it was when he was there the first time," Henniger recalled. "I said, 'Fred, I will do anything to have a job with you.' And, eventually, he gave me a job as an unpaid intern. So just like everyone else in this business, you work a year for nothing. And I learned a ton from Fred Whitacre when we played at Aloha Stadium in 1987." That year turned out to be the Islanders' final season, as the Pacific Coast League club moved to Colorado Springs for the 1988 campaign. Henniger, via Whitacre's recommendation, landed a job as general manager of the Pioneer League's Idaho Falls Braves. He calls the jump from intern to general manager one he "wasn't really qualified for," but it turned out well. "I ran the club for '88, '89, '90, and we set attendance records every year and profitability records every year, even though the Braves never sent us any hot prospects. It was fun," he said. In 1991, Henniger joined Whitacre in Colorado Springs for the first of what would be 17 seasons with the Sky Sox. Along the way, he got married and started a family; life was proceeding more or less as planned until the accident. "I learned a lot of stuff," he said. "Here's the big one: When I was in a coma, I didn't know who I was or where I was. I didn't know what I was. But at some point, I knew I needed to breathe. And I gathered every ounce of strength, much like a Mom pulls a car off her kid being crushed, that rush of adrenaline and power. I found a way to take a breath and it was the toughest thing I've done in my whole life. And after it was over, I relaxed and I had to do it again. ... If anyone had told me I had to take two, I would've given up the ghost then. But I was totally present. "And so you can get from Point A to Point Z one step at a time. ... That's how it's been for me, when things are rough. I've been through 20 operations and I've had a stroke, kidney failure and adrenal failure, all related to the accident." Henniger delivers this message regularly as part of the Colorado Springs Fire Department's Fire Factor program, sharing his story with at-risk youth who have engaged in dangerous fire-setting or bomb-making activity. "The kids I talk to, I let them know no matter how difficult your situation at home or what have you, you just take it a breath at a time if one day at a time is too much," he said. "But I'm the face of what can go wrong, and I use it, and I let them know there are actual consequences. When you put yourself in that position, it's just a matter of time before something happens." Although he almost died at Security Service Field, Henniger still finds it a warm and positive place. Like it was for many in Colorado Springs, Labor Day's season finale was a bittersweet occasion for him. The Sky Sox are relocating to San Antonio, and in their place will be a Rookie-level Pioneer League franchise. "It's a mixture. There's a little sadness, because I go back with this franchise farther than anyone else," Henniger said. "But I'm really excited about having this new team come down and I'm really focused on positive things that come with Rookie ball. Especially at 6,531 feet above sea level, we're not made for April and May. ... This should have been a short-season team, really, always, so let's just be thankful for all the years we had extra baseball." For Henniger, that sentiment extends far beyond the game. "Luckily, we don't know what's coming, because you wouldn't want to go on," he said. "But every day's precious, and I feel grateful for every breath I've got."